Our broad capabilities, deep knowledge, and powerful platform create compelling campaigns that deliver results. We help some of the most recognizable brands in the world create customers and increase return on marketing investment (ROMI) with an unparalleled combination of strategy, creative, and execution expertise. 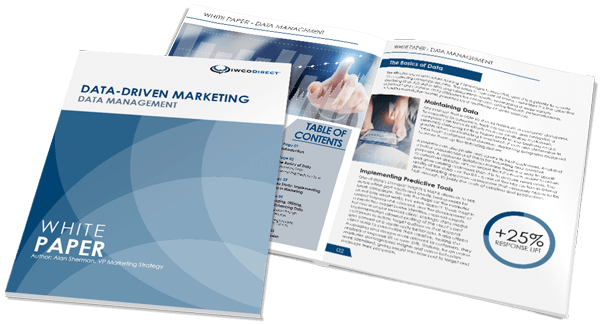 These direct marketing case studies showcase what we do, how we do it, and why leading companies turn to IWCO Direct as their direct marketing partner. When Time Warner Cable needed help launching its Business Pro Bundle through direct mail, we quickly got down to, well…business. When one of the largest regional telecom providers in the U.S. experienced sagging direct mail response rates, they turned to IWCO Direct with a challenge to develop new creative formats. Find out how this health plan achieved an amazing lift in response rates with our data-driven responder model, a reinvigorated approach to creative, and cost-effective execution. Too many creative packages across too many lines of business? No problem. We created specification standards and templates to streamline production and reduce costs. Our client is getting amazing results with our Champion/Challenger model that supports a testing strategy and trigger mail program. We created a fully-automated production platform for Delta Air Lines for credentials mailings that ensures quality, accuracy, and compliance with postal regulations. We helped this client create highly targeted direct mail campaigns to encourage enrollment in personalized health and wellness programs while meeting strict regulatory standards. Business and leisure travelers have different needs. Our digital platform allows for new “ultra” tier segmentation and relevant offers to make sure a major hotel chain is always home away from home. Learn how we helped develop a tailored workflow and new format to drive shoppers to a major retailer’s loyalty program. When Hurricanes Katrina and Rita swept through the gulf states, Mail-Gard made sure Whitney National Bank’s critical communications were produced and delivered to its customers.